The no votes have it, to varying degrees, with 70% for photo pair 4, 60% for photo pair 5, and 90% for photo pair 6. From these results, pair 6 certainly seems to be different people, but it is hard to be so sure for pair 4 and pair 5. In this series, I have now asked ‘Is this the same person?’ for 6 pairs of faces. Photo pair 1 was a control case where I knew the answer was ‘No’. Photo pairs 2 to 6 are all about comparing people in the group photo below with other photos in the same album. Allport, Thomas B. (photographer, Uttoxeter). ca. 1860s-early 1870s. Group of 8 people. Faces extracted for comparison in photo pairs 2-6. 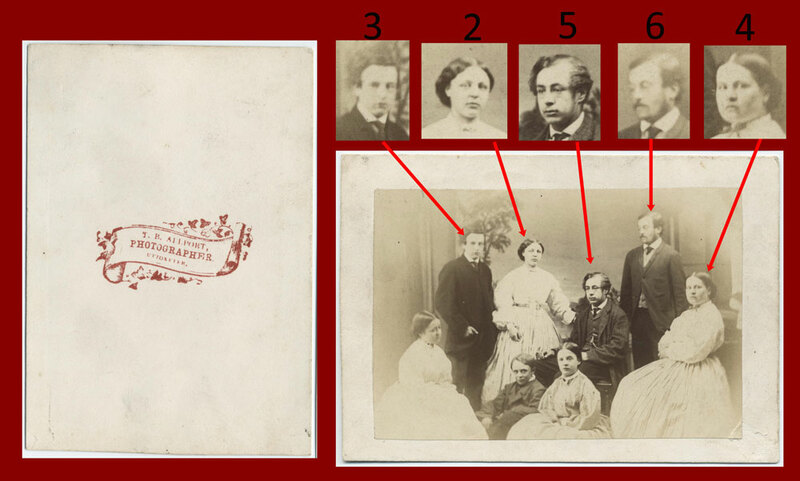 Three of the photo pairs were included in a project I undertook in 2010 for the Genealogical Studies postgraduate program at the University of Strathclyde. The methods were a little different as most respondents gave their answers offline and they were asked to give ‘instant’ answers rather than try to consciously analyse the photo pairs. In the Strathclyde study, 4 of the 5 control face pairs known to be the same person scored 70% or more ‘Yes’ votes, but only 1 of 4 the control face pairs known to be different people scored over 70% of ‘No’ votes. So I thought responses to face pairs of unknown identity with a substantial majority of ‘Yes’ votes, especially those over 80%, were likely the same people. I hoped for consistent results for the 3 pairs repeated in this series. Photo pair 2 delivered the same result, but photo pairs 1 and 5 did not. 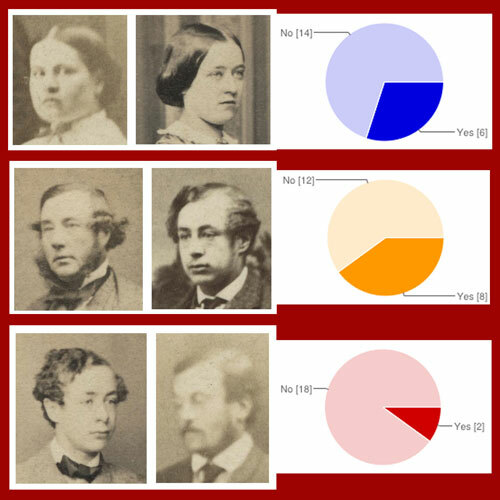 Comments from respondents suggest that they spent time consciously analysing the photo pairs. If undecided did you vote ‘No’? Did you become less sure the longer you tried to analyse the photos? Are these potential reasons for the preponderance of ‘No’ votes? Could the 60-70% middle ground ‘No’ votes really indicate uncertainty? I welcome comments on these questions. I admit that I hoped that pairs 2 – 6 would have decisive ‘Yes’ answers to support the conclusions summarised in Cartes de Visite album links to the Stanley family and Earls of Derby.